SINGAPORE - It is "too quick a conclusion" to call into question building certification over the cladding issue, said Home Affairs and Law Minister K. Shanmugam. He told Parliament on Wednesday (Jan 10) that there is no evidence at this stage to suspect the certification process. "One has got to be careful about jumping to conclusions at this point as to whether the entire certification system has been compromised, because the certification system relies on identifying international (and local) institutes of repute," he said. Mr Shanmugam added that these institutes are recognised worldwide. Workers' Party Non-Constituency MP Daniel Goh had asked how non-compliant combustible panels were given certificates allowing their use on external facades here. He was referring to two brands of aluminium composite panels used as cladding material - Bolliya and Bolli-Core FR - which the Singapore Civil Defence Force (SCDF) flagged last December. Panels from these brands had received Certificates of Compliance (COCs) that rated them as Class "0" - the most stringent standard for fire-rated combustible panels. 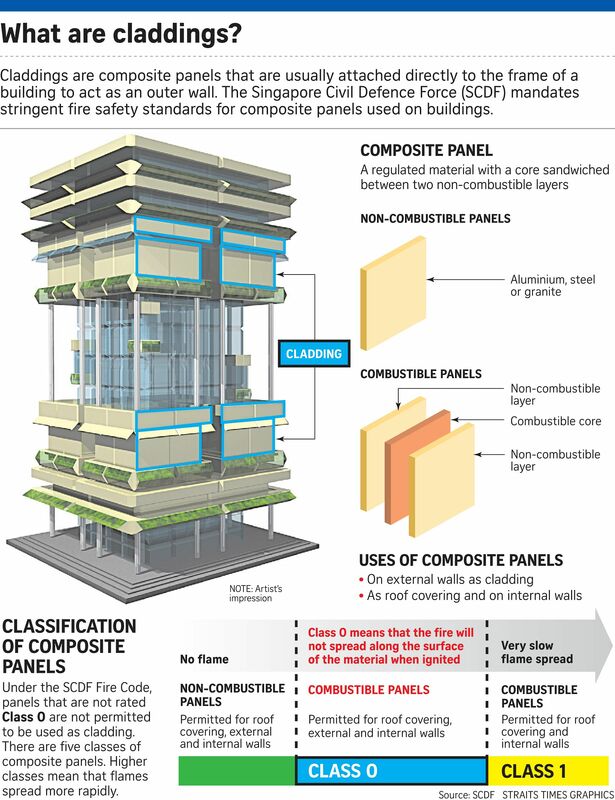 However, SCDF tested the panels as part of a wide investigation into the use of aluminium composite cladding, and found that they did not meet the required Class "0" standard. So far, seven buildings containing these two brands are affected. Three have removed the panels, said Mr Shanmugam. This is on top of an earlier discovery of non-compliant Alubond-branded cladding panels last year, which has affected 35 buildings. The panels at 17 of these buildings have been taken down, and are being removed from the other 18, he added. The investigation into the use of cladding here is ongoing. Mr Shanmugam said the investigators have no evidence or reason to suspect the certification process at this stage. He added: "We will be investigating all possibilities, including whether there could be manufacturing defects, and differences between samples and actual material." Dr Goh also asked if there will be further testing of other brands of cladding. Mr Shanmugam replied that the SCDF has contacted industry partners, required buildings' qualified persons to submit information about their buildings, and conducted a second round of checks, which was how the two cladding brands Bolliya and Bolli-Core were flagged. "We have also asked for the annual audit to be expedited, and this should cover all the other (brands)," he said, referring to the regular audit by certification bodies here.